Sails is pretty awesome at scaffolding and organizing your NodeJS project. But, when it comes to using some packages it can get messy with all that middleware pieces in between. In this post we'll look at how to configure your Sails app to use Passport for third party authentication. We'll use Facebook as an example and will leverage MongoDB for persistence. Sails is a framework that "makes it easy to build custom, enterprise-grade Node.js apps." It is designed emulate MVC design patterns common in Ruby on Rails, but with a strong focus on data-driven applications. Creating an application is as easy as running "sails new ApplicationName", which will create a well organized project structure. It does come with a lot of configuration aspects that are unnecessary for small prototype projects, and might introduce complexity to small performance-driven micro-services. That being said, it's pretty awesome. If you haven't tried it, I really recommend it. Passport is a NodeJS strategy-modelled package that simplifies the authentication task in your application. It supports many common strategies; like Facebook, Twitter, Github, Google; and some for services you've probably never heard of. What day is it today? This is probably outdated. The NodeJS-verse moves quick. Sometimes too quick; you blink and the code you committed is already deprecated. So if you are following this guide remember that the following might already be too old. This post was written and tested on 2015-10-30. And I used Sails v0.11.2, Passport v0.3.0, and Node v4.2.1. We will use MongoDB to persist our data. MongoDB is a non-relational document database designed for fast and easy development and even easier scaling. If you're starting from scratch you should install NodeJS, and install MongoDB. Create a new Sails Application. Configure and install dependencies for MongoDB and Passport. This will install the dependencies you just specified in the package.json file. That's it for creating and persisting the User model. Sails will take care of the rest. // Here is were we specify our facebook strategy. We have to now bind this controller to URL patterns, let's do that in the routes file..
We will add the routes to "/login", "/logout" and "/home". You'll notice we haven't created HomeController, we'll do that later. That's a lot of configuring and typing right there. Since we're half-way let's take a break for Soda and Popcorn. We will need to create a Facebook Application. Visit https://developers.facebook.com/ to create an application. I just create an advanced application and modify its settings. We will need to add a "Platform", choose "Web" and add the following url: "http://localhost:1337/". This will be used by Facebook to authorize and redirect to when doing the "OAuth dance". Note the App ID and App Secret, we will use them later when configuring our application. Let's continue with our Sails application. Remember to configure your client id and secret from Facebook, in "YOUR_CLIENT_ID" and "YOUR_CLIENT_SECRET" above. Time to tell Sails how to handle when a user is authenticated or not. Edit the "api/policies/sessionAuth.js" file. We will tell Sails that if a request is authenticated proceed to the next policy or, if being the last policy, the controller. If the request is not authenticated we will redirect it to the '/login' route we configured above. However, the file is still publicly accessible. We will need to change the policies. Sails will start your application. 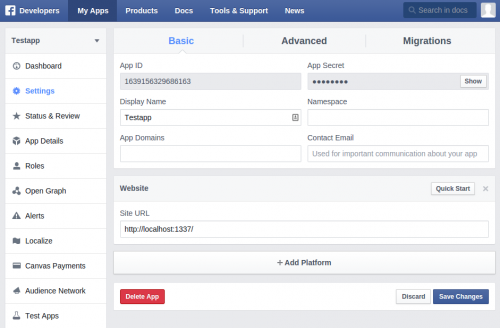 You should now be able to visit http://localhost:1337/home, be able to authenticate with Facebook and then redirected back to home to see the user model. Logout will redirect you back to the login page. You can check out many of the strategies Passport supports. With the skeleton you've built above you can plug in any more you want. Did I miss something, shout it out in the comments, and code on! There doesnt seem to be any callback code? hi how exactly logout works. after logout and login I’m accessing same Facebook user who was logged in previously.